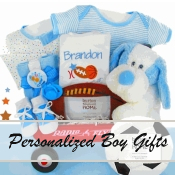 Many of our baby gifts are available with an option to personalize. Turn a beautiful gift into a memorable keepsake! With a wide selection of custom designs for both girls and boys, personalized gifts can include the baby�s name, birth information, weight, and more using embroidery, artwork, laser etching, and painting techniques. If you�re looking for something guaranteed to impress at the baby shower, these are the gifts to choose. Questions? Please Contact Us. All prices include free shipping within the Continental United States.